The Tropical Rainforest of Sumatra, is situated in the middle of the island Sumatra, Indonesia, and consists of three national parks; Gunung Leuser National Park 8,629.75 square kilometers (3,331.97 sq mi), Kerinci Seblat National Park (KSNP) 13,753.50 square kilometers (5,310.26 sq mi) and Bukit Barisan Selatan National Park (BBSNP) 3,568 square kilometers (1,378 sq mi). The rainforest covers a total area of 25,000 square kilometers (9,700 sq mi), and represents a major portion of all the forests on the island of Sumatra. The national parks that make up the heritage site are all located on the spine of the Bukit Barisan Mountains, known as the Andes of Sumatra. Offering a magnificent panoramic view, the mountainous and untouched national parks contrast remarkably to the cultivated and developed lowlands of Sumatra. The mixed views from the Bukit Barisan mountain chain of the stunning Lake Gunung Tujuh (the highest lake in Southeast Asia), the splendor of the giant volcano Mount Kerinci, and many small volcanic, coastal and glacial lakes in natural forest settings create an environment of spectacular beauty. The three national parks host varied habitats and unique biodiversity. They comprise 50 percent of the total plant variety in Sumatra. At least ninety local common species have been recognized in Gunung Leuser National Park. Populations of both the world’s largest flower (Rafflesia arnoldi) and the world's tallest flower (Amorphophallus titanum) are found there. During the twentieth century, this once vast island tropical rainforest was condensed into secluded areas in the space of 50 years. UNESCO designated The Tropical Rainforest Heritage of Sumatra a World Heritage Site for its biodiversity and its lowland and mountain forest. The mountains have year-round little changing high temperatures, high humidity and high rainfall for nine months in wetter areas, seven months in drier areas. That climate has encouraged the high speciation (formation of new species) and variety of species. 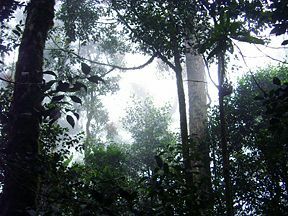 Gunung Leuser National Park, receives 3,000 millimeters (120 in) of rainfall, in the north, and collects 4,657 millimeters (183.3 in) in the lowland south. Temperatures average between 21 °C (70 °F) to 28 °C (82 °F) and the humidity measures above 60 percent, especially when over 1,700 meters (5,600 ft). In Kerinci Seblat National Park, the rainfall averages 2,990 millimeters (118 in), temperatures range from 16 °C (61 °F) to 28 °C (82 °F) with humidity high at 77-97 percent). In Bukit Barisan Selatan National Park, the rocky west received heavy rain fall, especially during the November to May monsoon: rainfall measures 3,000 millimeters (120 in)-4,000 millimeters (160 in). The east receives less rain, with 2,500 millimeters (98 in)-3,000 millimeters (120 in) of rainfall and the temperature ranging between 20 °C (68 °F)and 28 °C (82 °F). "Orang-utan" is Bahasa (Indonesian) for "man of the forest." Gunung Leuser National Park is a national park covering 7,927 square kilometers (3,061 sq mi) in northern Sumatra, Indonesia, straddling the border of North Sumatra and Aceh provinces. The national park, named after 3,381 meters (11,090 ft) high Mount Leuser, protects a wide range of ecosystems. An orangutan sanctuary of Bukit Lawang sits inside the park. Gunung Leuser National Park numbers among the 18 Indonesian regions classified by the World Wide Fund for Nature (WWF) among the 200 global ecoregions of importance for preservation of the world’s biodiversity. 174 mammals, three endemic and 21 listed as threatened in 2000. Little is known about the smaller mammals. 380 species of birds have been listed, 13 endemic and 52 threatened. Some of the important species include the orangutan, Sumatran rhinoceros, and the pigtailed monkey. Important plants include Rafflesia arnoldi, and the Amorphophallus titanium. Rueck’s blue flycatcher and the white winged duck number among the several important bird species. Gunung Leuser National Park in the north extends 150 kilometers (93 mi) in length and 100 kilometers (62 mi) in width. Mostly mountainous, 40 percent of the park stands over Template:1,500 in height. Twelve percent of the Park, in the lower southern half, stands less than 600 meters (2,000 ft), running 25 kilometers (16 mi) along the coast. Eleven peaks stand over 2,700 meters (8,900 ft), Gunung Leuser the highest peak at 3,466 meters (11,370 ft). 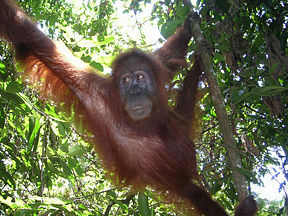 Gunung Leuser National Park serves as one of the two remaining habitat for Sumatran Orangutans (Pongo abelii). In 1971, Herman Rijksen established the Ketambe research station, a specially designated research area for the orangutan. In November 1995, the Langkat Regency government proposed a road to connect an enclave, known as Sapo Padang, inside the park. At that time, 34 families who had been living in the enclave formed a cooperative in March 1996. They submitted a proposal to develop an oil palm plantation in August 1997. In accordance to the government's Poverty Alleviation Program, the authorities accepted the oil palm proposal and the road construction. The project has resulted in deforestation of 42.5 square kilometers (16.4 sq mi) In June 1998, local office of the Forestry Service issued a decree stating that the Sapo Padang enclave was no longer legally a part of the national park; a controversial decision which consequently led to further forest destruction during the road construction and invited newcomers to slash and burn forest area to create local plantations a way deeper to the park. In 1999, two university-based NGOs filed a legal suit to the Medan State Court, while a group of 61 lawyers brought a parallel case in the National Administrative Court. The National Administrative Court rejected the case, while the local NGOs won with 30 million rupiahs damage in their case. Extensive logging and clearing, road-building and oil palm plantation continued operating inside the national park during and after the court cases. Kerinci Seblat National Park extends 350 kilometers (220 mi) along the Bukit Barisan, averaging 45 kilometers (28 mi) wide and 2,000 meters (6,600 ft) above sea level. The mountains range in the northern part measure 800 meters (2,600 ft)-1,500 meters (4,900 ft) in height. Most of the park is mountainous. Mount Kerinci, stands 3,805 meters (12,480 ft), the highest mountain and volcano in Indonesia. Located between 100°31'18"E - 102°44'01"E and 1°07'13"S - 3°26'14"S, the park includes hot springs, rivers with rapids, caves, scenic waterfalls, and the highest caldera lake in Southeast Asia - Lake Gunung Tujuh. The park serves as home to a diversity of fauna and flora: 85 mammal species have been recorded, including five endemic and 23 threatened. Sumatran Tigers, Sumatran Rhinoceros, Sumatran elephants, Bornean Clouded Leopard, Malayan Tapir, Malay Sun Bear number among the rare fauna. 370 species of birds have been listed including 23 endemic and 58 threatened. The White-winged duck and the Sumatran ground cuckoo number among rare bird species. Over 4000 plant species grow in the park area, including the world's largest flower, Rafflesia arnoldi, and the tallest flower, Titan Arum. Hopea beccariana, Shorea ovalis ssp. seicea number among the rare plants. Geological map of Bukit Barisan mountain range. Bukit Barisan Selatan National Park is 350 kilometers (220 mi) long and 45 kilometers (28 mi) wide on average. The northern two-thirds of the park are mountainous, averaging 1,500 meters (4,900 ft) with the highest point, Mount Pulung standing at 1,964 meters (6,440 ft). Mountains in the southern half stand at a lower altitude. 90 kilometers (56 mi) forms a cape with borders on the sea for half its length. Many of rivers have their source the park. Several lakes and hot springs may be found. 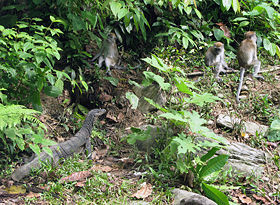 Ninety eight mammals have been recorded in Bukit Barisan Selatan National Park, one endemic and 25 threatened. 379 species of birds, seven endemic and 58 threatened, have been sighted. Fifty nine reptile and amphibian species are recorded. BBSNP has the same bird species as KSNP. Some important mammal species: Sumatran elephant, and the leatherback turtle. Sumatran Tiger (approximately 40 adult tigers or ten percent of the remaining Sumatran tigers live in the park). The park has recently lost 20 percent of its forests to illegal agriculture, according to the World Wide Fund for Nature. WWF found that more than 450 square kilometers (170 sq mi) of park land is under coffee cultivation, and the organization has been working with multinational coffee companies (including Nestle) to avoid buying illegally grown coffee. ↑ World Database on Protected Areas: Entry of Gunung Leuser National Park. wcmc.org. ↑ S. A. Wich; I. Singleton; S. S. Utami-Atmoko; M. L. Geurts; H. D. Rijksen; and C. P. van Schaik, "The status of the Sumatran orang-utan Pongo abelii: an update." Flora & Fauna International 37 (1) (2003): 49 doi=10.1017/S0030605303000115. ↑ S. A. Wich; S. S. Utami-Atmoko; T. M. Setia; H. D. Rijksen; C. Schürmann, J.A.R.A.M. van Hooff and C. P. van Schaik, "Life history of wild Sumatran orangutans (Pongo abelii)." Journal of Human Evolution 47 (6) (2004): 385–398. . (PDF) Retrieved September 13, 2009. ↑ Claire Leow, January 19, 2007. Nestlé to scrutinize Indonesia coffee amid wildlife-endangerment fears, International Herald Tribune. Kramer, Randall A., Carel van Schaik, and Julie Johnson. Last stand: protected areas and the defense of tropical biodiversity. New York: Oxford University Press, 1997. ISBN 9780195095548. Matthews, Emily, and Global Forest Watch (Organization) and Forest Watch Indonesia (Organization). The State of Forest in Indonesia. Washington, DC: World Resources Institute. 2002. ISBN 1569734925. Nierenberg, Danielle. State of the world 2006: a Worldwatch Institute report on progress toward a sustainable society. New York: W.W. Norton, 2006. ISBN 9780393327717. 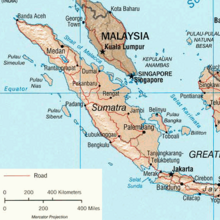 Tan, Kim H. Soils in the humid tropics and monsoon region of Indonesia. (Books in soils, plants, and the environment.) Boca Raton: CRC Press, 2008. ISBN 9781420069075. Terborgh, John. Requiem for nature. Washington, DC: Island Press [for] Shearwater Books, 2004. ISBN 9781559635882. Witton, Patrick. Indonesia. Melbourne: Lonely Planet, 2003. ISBN 9781740591546. Links retrieved retrieved December 18, 2015. "Tropical Rainforest Heritage of Sumatra, Indonesia", The Encyclopedia of the Earth. 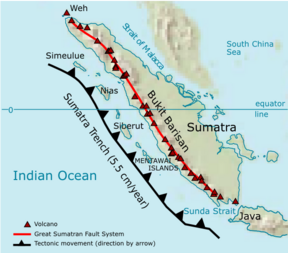 History of "Tropical Rainforest Heritage of Sumatra"
This page was last modified on 18 December 2015, at 17:23.